I have an 8700k on z370 chipset (asus Maximus x code). I recently updated MEI drivers to the driver only package "1828.12.0.1152 WHQL". I randomly happened to run a crystal disk bench and noticed my random write times had gone way way down. Could that be caused by these drivers? I know I am on older ME firmware (11.8.55.3510). so I suppose I could try updating? Is reverting MEI drivers a pain in the rear or do I just revert via device manager and test? Or maybe these things arent related to Nvme speeds at all? Can chipset drivers mess with that? @Guitarmageddon - MEI drivers easy to change, uninstall current in add/remove programs, install new/other version. The rest of your question someone else will have to answer. Could that be caused by these drivers? No. Make sure the firmware is healthy via MEInfo and MEManuf. If it is, the issue is unrelated. What do you mean by healthy? Error 108: Fail to load driver (PCI access for Windows). Tool needs to run with an administrator privilege account. So here is what I found. Does all this seem correct for a z370 board? I know my bios is an older version, but what about the rest? No errors right? I ran both meinfo and memanuf down at the bottom of the window. Use command prompt not power shell.. Sorry, I see in your image that worked OK. Looks good to me, but I am not ME expert. You should do a MEInfo -verbose to be 100% sure but yes, it looks fine. Ok thanks. What do you mean by that exactly? Sorry, I never mess with power shell, and rarely mess with cmd prompt. Just for the special one-offs like this, so I always have to spend 20 minutes figuring out the syntax all over again. So I ran with adding that to the path and yes, it did return a lot more information. No errors or anything appearing out of the ordinary however. But thanks for the info Ill remember that for next time. Hey guys, sorry I'm a bit new to updating ME firmware (as in never done it before) and just can't figure out how to update the firmware version in BIOS. I've updated the drivers through Windows, just can't figure out how to update the firmware. I'm running a 4790K on an Asus Sabertooth Z87 mobo and the current version in the BIOS states 9.0.22.1467. When I run the ME Analyzer that is listed as my Flash Image Tool and the version is actually listed as 9.0.30.1482. My Chipset Support is LPT and SKU is 1.5MB. If anyone can give me any help that would be greatly appreciated. Sorry for the complete ignorance on this. 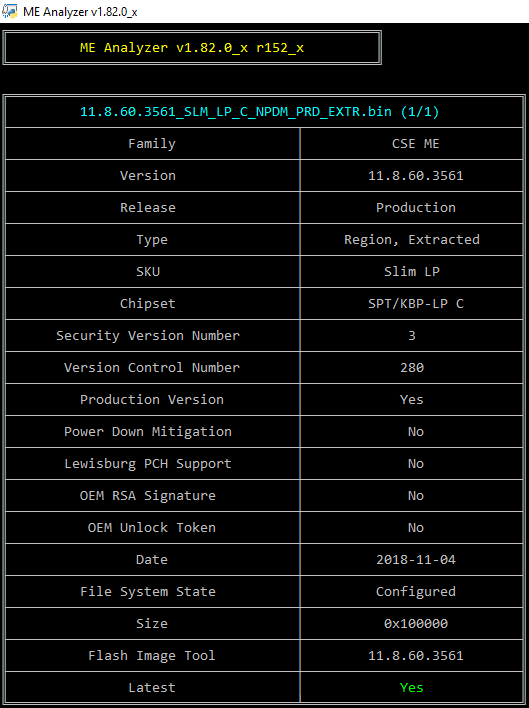 I'm in need of Intel ME SPS Tools for version 2.x firmware. I have a server(C602 chipset & E5 v2 CPUs) giving me grief over a firmware upgrade and this tool might help a lot. Please PM o reply to this post. Everything is explained at the first post. Ignore the Flash Image Tool version. Sorry but we have no such tools. Anyone have a mirror to download intel me system tools v9.1 ? 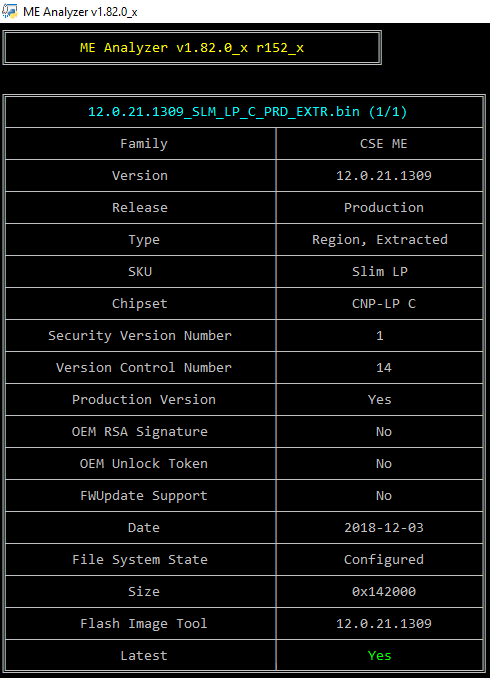 Input the chosen CSME 12 firmware into ME Analyzer tool and make sure that "FWUpdate Support" is not reported as "Impossible". This is only relevant to Corporate EXTR images. To use with FWUpdate, you must pick an EXTR-Y and not EXTR-N firmware image. 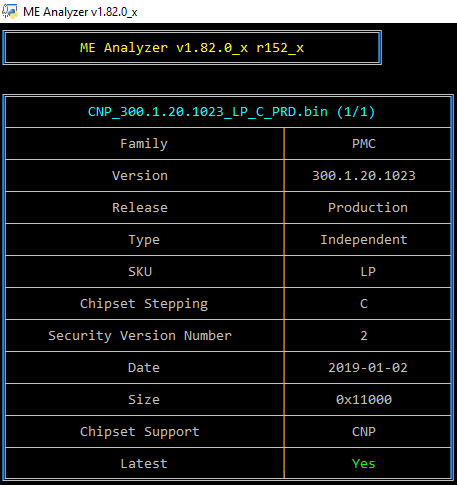 You must use the latest ME Analyzer v1.82.0 or newer.